What to Look for In Security Grilles? While most of us pay attention to the front door security – installing deadbolt locks, high security locks, digital peephole and security camera – windows security often take a back seat. Needless to say, unprotected and unlocked windows make it extremely easy for a burglar to strike your home. You have an extremely effective, low-tech and simple means of increasing home security – by installing security grilles on your windows. These are particularly necessary if burglaries are on the rise in your neighborhood or you have windows at basement or ground-level that are obscured by foliage or other buildings. There are many varieties of grilles available and choosing the one that is perfect for your home is not as difficult as it seems. Permanent or fixed security grilles – These are great for long-term use and works best for settings where emergency exits are not to be considered. Permanent bars work best for high security areas that require constant protection. Swing away security grilles – These types of security grilles are good for emergency exits. They also offer easy access to clean the glass windows and are normally secured from the inside with a padlock or quick-release mechanism. Removable or foldable security grilles – Such grilles, also known as collapsible grilles, are best suited for aesthetic purposes. They can be moved out of sight during the daytime and put in place again at night for your peace of mind. Grilles that are installed from the outside of the building may be affixed to the brickwork or window recess. Roller or hinged grilles are the popular ones in this category with steel being the material of choice. Decoration is not of prime importance when looking for external installation. Internally installed grilles are suitable if you do not wish to compromise on the aesthetics of your property. They can be designed to look discreet and are also more secure as the lock is also on the inside. While the height of the grille has to be in proportion to the size of the opening, the width of the grille bars can be worked out according to your choice. Narrow grilles are preferred by most people since they ensure that your view is not significantly impacted. These are also easily available as opposed to wider grilles which are stronger but can hamper your view. Security grilles can restrict emergency access such as that required in case of a fire. It is best to get such security grilles professionally installed particularly if your property insurance depends on it. Budget is also an important element when shopping for security grilles. The cost will depend on the nature and the quality of material used. Always check the security ratings before you buy a security grille. If you are extremely keen on the design and color of the grilles, you also have the option of commissioning these according to your specifications. This is also a good choice when you have windows in awkward shapes that need to be safeguarded or other unique designs to be adhered to. Burglars and intruders often seek out homes which allow them to break in easily and avoid any complications such as bars on the windows. 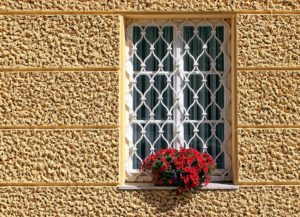 Window security grilles are quite effective simply because they prevent easy access into your home.